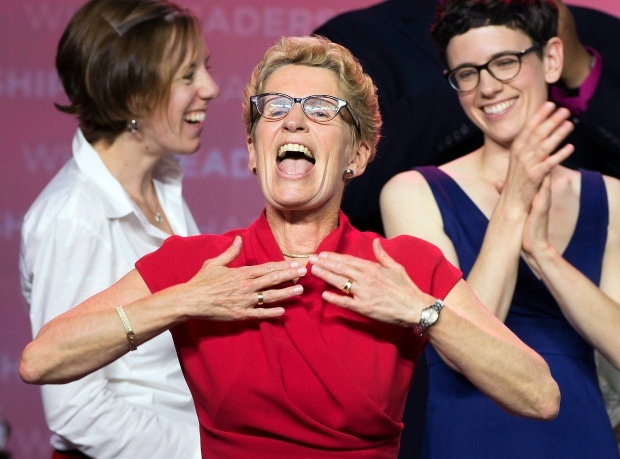 TORONTO -- Ontario's Liberals have won a majority government in the provincial election. Premier Kathleen Wynne has promised to reintroduce the Liberal budget -- which failed to get the support of the opposition parties last month, triggering the election -- within 20 days. -- eliminate the $12.5-billion deficit by 2017-18. -- create a 10-year $2.5 billion Jobs and Prosperity Fund to partner with industries poised for growth. Measures include $10 million for a nine-month paid community work and service program to help graduating high school students, and $5 million in grants for the next two years for new small-scale manufacturers. -- invest $15 billion in transit projects in the Greater Toronto and Hamilton area, including the electrification of GO Transit commuter trains and a downtown Toronto subway relief line. -- invest $14 billion in roads, bridges, highways and other transit projects outside the GTHA, including $1 billion to support the development of the Ring of Fire in northern Ontario, with or without financial help from the Harper government. -- provide up to $230 million to expand access to natural gas in under-served communities, including agricultural communities. -- increase taxes for individuals earning more than $150,000. -- increase the minimum wage to $11 on June 1, 2014, and index it to inflation after that. -- create an Ontario retirement pension plan which could be integrated into a CPP expansion in the future. -- guarantee that every Ontarian has access to a primary care provider. -- continue to reduce health-care wait times, focusing on referrals to specialists. -- fund 20 more hospices. -- continue to expand the scope of practice for nurses and pharmacists. -- improve math scores and help kids be more active through 60 minutes of physical activity connected to their school day. -- provide wage increases to child-care workers outside the public school system. -- continue the 30 per cent off tuition grant for post secondary education. -- promise to build new campuses and create spaces for 15,000 more post secondary students in Ontario. -- increase the number of apprentices training in Ontario. Find out the polling station where you can vote. Ontario is divided into 107 electoral districts. Finding which one you live in is easy. You can do so one of three ways. Find out all you need to know about Election Day.